Join Charis in welcoming author Kathleen Archambeau for a very special Pride Month book signing! She'll be at Charis for a meet and greet and book signing from 2-3pm on Saturday, October 7th. 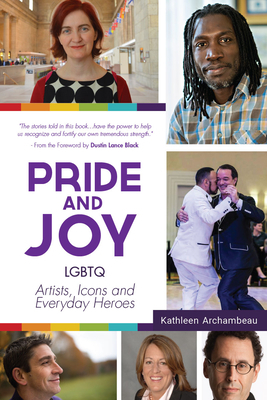 Archambeau will sign copies of Pride & Joy: Lgbtq Artists, Icons and Everyday Heroes. Stories of success, happiness and hope from the LGBT community and stories that comprise the best of LGBT history ─ Pride and Joy: LGBTQ Artists, Icons and Everyday Heroes tells the stories of queer citizens of the world living OUT and proud happy, fulfilling, successful lives. Diverse and global. Famous and unsung. There is a story here for everyone in the LGBT community who has ever questioned their sexual orientation or gender identity, or discovered it. Pre-order your copy of the book today or pick one up at the store. Stories that comprise the best of LGBT history: Pride and Joy: LGBTQ Artists, Icons and Everyday Heroestells the stories of queer citizens of the world living OUT and proud happy, fulfilling, successful lives. Diverse and global. Famous and unsung.